We all say it in slightly different ways: A superior customer experience requires consistent, seamless, experience across all channels. Depending on our job, we tend to focus on different integration challenges. Easy to say, but Mayur Gupta points out just how multi-faceted and formidable this fragmentation is. Brands have as much of a chance of driving frictionless omnichannel consumer experiences as a Formula One race car driver trying to win a race on flat tires. Impossible!!! The very model and capabilities used to make the experience omnichannel and seamless is its biggest roadblock. We are trying to create connected experiences using a massively fragmented ecosystem spanning data and technology, agencies and media management, and organizational and operating models. With all the disruption within the digital landscape putting the consumer at the center and in full control, the consumer has effortlessly become omnichannel while brands still struggle with being multichannel, at best. As Scott Brinker and others have shown, the marketing technology landscape is nightmarishly large and complex. And of course marketing needs vary widely by organization. Gerry Murry has a framework to help marketing execs get started organizing and building their strategy. Reading articles and watching videos also require two different brain processes. When we read, the process requires us to be actively involved. The brain gets a much better workout when reading vs. watching, and the process requires a longer attention span and deeper cognitive efforts. Visitors have their own preferences, many will always click on the video option because it is the easiest and therefore the most natural choice. But many others will choose to read text by default because they want to control their experience, dig into details, and organize thoughts in different orders. Text provides more reader control. It is also usually faster and more efficient. As a marketer you need to consider different visitor preferences, but you also need to match the form to the job. If you want to attract a browser’s attention a video is usually a better way to go – it provides less of an effort-barrier. But if you want a visitor to engage in the extra work to learn about product features, options, and pricing so they can make a decision to buy, text is likely to be the least frustrating and most effective way to get the job done. Quartz is doing a great job pushing towards a modern social, mobile, web news format. Video use, even by respected media channels, is often still largely off-putting, so it is worth keeping an eye on QZs video experiments. The interesting part, though, is that there are now lots of different kinds of reach. Loosely, the path of all consumer electronic categories is to evolve as ever more computer-y gadgets, until a tipping point occurs and they turn into ever more gadget-y genuine computers. … Apple seemingly tries to enter markets at, or just after, that tipping point … to produce a gadget-y computer that the computer-y gadgets from the established market leaders cannot compete with… That was the iPhone. Before its launch, I said that the Apple Watch would be as much a watch as the iPhone is a phone. However it does not feel like a watch conceptually. I find myself drawn into a conversation by its vocabulary of vibrations. I find myself talking to it. I find myself listening to it. I find myself glancing at information about faraway places. I find myself paying for things with it. I find myself checking into flights with it. I order transportation, listen to news, check live data streams and get myself nagged to exercise. It tells me where I am. It tells me where to go. It tells me when to leave. Lot’s of commentary on the Facebook research published in Science last week. The first Read more link goes to the reaction of Eli Pariser the author of the book, The Filter Bubble: What the Internet is Hiding From You, but I’ve added a few others that are meaty. Read more here, and here, and here. As we did last year we’ve posed some of our attendees’ most frequently asked questions to speakers who will be at this year’s Gilbane Conference. Today we’re spotlighting Pawan Deshpande, Founder & CEO, Curata. You can see all Speaker Spotlights from our upcoming conference as well as last year’s event. Mobile forces simplicity and succinctness, for two reasons, limited screen real estate and limited attention spans, because content is often consumed in a casual setting with other interruptions. It’s forcing us to boil our content, and messages down to the minimum and shed all the excess. There is so much discussion about technology for marketing these days because marketing in many ways is the last one to resist technology. Other disciplines have already learned and rely heavily on technology. For example, sales has salesforce, customer support has well-adopted ticketing systems, engineering has source control and bug tracking systems. All of these provide in-depth accountability, management transparency and organization. Marketing is still, however, struggling to adopt CMSs and marketing automation largely because of diverse needs, and the resulting vendor fragmentation. If anything, marketing can learn about technology adoption from other disciplines. Although sometimes used interchangeably ‘content strategy’ and ‘content marketing’ refer to very different though often connected disciplines. How and where should these activities be organized? 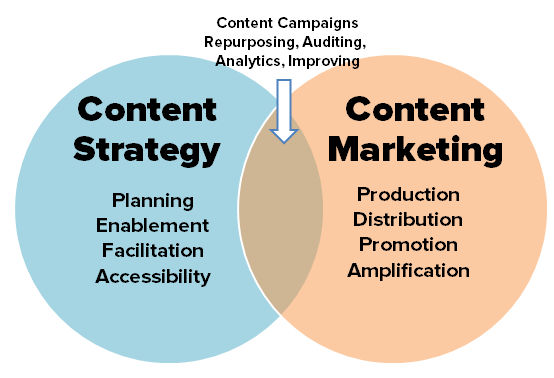 Content marketing and content strategy are different but often overlap. My diagram below is my perspective on where the responsibilities differ and are shared. Does the ‘internet of things’ have an immediate or near-term impact on your organization’s information or collaboration infrastructure? How so? Working in B2B setting, it does not have an immediate impact on us. Just like we are setting website personalization have the first impact on B2C, I expect it to trickle down to B2B companies from a content standpoint years from now. Register now to hear more from Pawan and all of our speakers. As we did last year we’ve posed some of our attendees’ most frequently asked questions to speakers who will be at this year’s Gilbane Conference. Today we’re spotlighting Tom Alexander, Founder and CEO, PK4 Media, Inc. You can see all Speaker Spotlights from our upcoming conference as well as last year’s event. Organizations should definitely align their content delivery priorities to reach their target audiences not only on desktop, but also on mobile and tablet devices. Marketers need to be cognizant of which platforms their audience uses to interact with their content. Aligning the content strategy to ensure they are connecting with their target audience in an appropriate manner is very important. Many technologies silo content delivery to specific platforms, however, audiences typically jump between multiple devices and screens. Using a true cross-platform technology that can optimize delivery to the best performing placements will be a more efficient and cost-effective way to reach the target audience no matter what device they are using. Technology allows processes to be automated and it also provides marketers with an extensive pool of information data. This data allows other departments in an organization to learn more about their target audiences. As the information gathered about their behavior online, across tablets and mobile devices and offline behavior becomes more apparent, other departments can create new and different ways to interact with customers. Content strategy and content marketing should always be aligned. In order to make the greatest impact with your content, there needs to be a specific strategy in regards to where the content will appear. At the same time, specific pieces of content need to be created to meet the needs of the audience viewing them. Strategy and marketing must work hand-in-hand to be most effective. PK4 Media, being a technology company, is in tune to the latest and greatest connectivity options, so the Internet of Things could definitely come into play for our infrastructure in the future. Wednesday, December 3: 9:40 a.m. – 10:40 a.m.
Register now to hear more from Tom and all of our speakers. 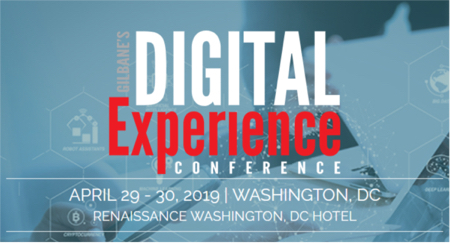 As we did last year we’ve posed some of our attendees’ most frequently asked questions to speakers who will be at this year’s Gilbane Conference. Today we’re spotlighting Rachel Metscher, Director of Content Marketing, ICF International. You can see all Speaker Spotlights from our upcoming conference as well as last year’s event. I think it is important to note how your content will look and feel on mobile. I know for my team, we are trying to find ways to repurpose content in visual forms; however, it is influenced by the fact that our audience are accessing different types of information both at the office and at home. While technology is important, it is also important to remember that technology is powered by people. People will make or break the success if implementing technology. Getting everyone on board is key to adoption. If you don’t plan for adoption and use your technology project is dead in the water. Planning is the key to success. Every great campaign starts with a plan. Content marketing is no different. I try to advice our team to begin with who are we reaching and why should the care. With those two questions in mind we weave our content marketing initiatives into our editorial calendar to match up the content with the audience we want to reach. Marketers face a real challenge of quantity versus quality in an age where everyone is a publisher. Again, in my mind, the purpose of content is to communicate with your prospects in a meaningful way. It’s about creating content that your customer needs, not what you want to produce. There is a huge difference. Organizations need to rethink their content creation in terms of value and relevancy. Without value and relevancy the content cannot deliver business results. Register now to hear more from Fred and all of our speakers. How does your organization manage and value paid, owned, and earned content? Is there a strategy for each of the three types? A budget? If you are struggling with measuring the value of marketing related content you are certainly not alone – there is just no easy way to do it. In this session, Gerry Moran from SAP talks about the need for brands to manage and scale the three types of content together to engage customers throughout the sales cycle. Randy Woods from nonlinear creations describes a technique in use for modeling content and mapping it to online behaviors to get a better handle on content marketing costs and return. Join us Wednesday, December, 3: 11:40 a.m. – 12:40 p.m. at the Gilbane Conference to learn more. See the complete conference schedule.